Phabricator is free and open source set of tools that ease the process of building software and allows developers and companies to build better software. It includes tools for differential code review, repository hosting and browsing, monitoring tool, bug tracker, wiki and much more. Phabricator originally was developed as an internal tool at Facebook, but now it is under active development by hundreds of unique developers. In this tutorial we will install Phabricator on a Debian 9 VPS with Apache, PHP and MySQL server. In this tutorial we will install all necessary prerequisites. We will use Debian 9 VPS running on our SSD 2 VPS hosting plan. As mentioned in the Prerequisites section, we have to install a web server in order to run Phabricator. In this tutorial we will install Apache web server. Once the database server is installed, run the mysql_secure_installation post-installation script to secure the server and set your MySQL root password. Completed applying all schema adjustments. Note that, you have to run this script every time you update Phabricator in order to apply the new updates. Finally, open your favorite web browser and navigate to http://phabricator.yourdomain.com and follow the on-screen insctructions to complete the installation and create your initial administrator account. For more information on how to configure and use Phabricator, please check their official documentation. 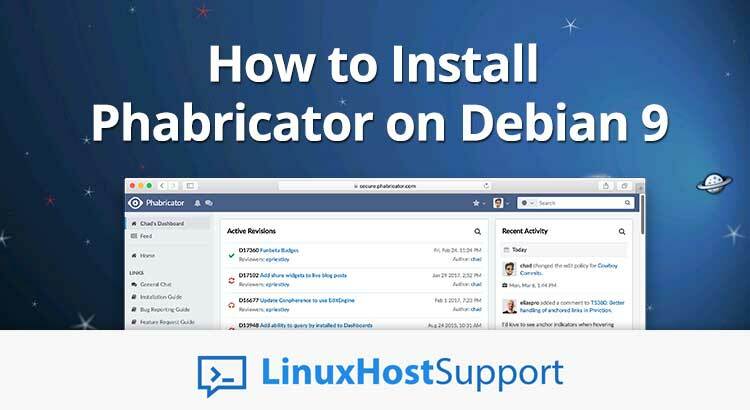 Of course you don’t have to Install Phabricator on a Debian 9 VPS, if you use one of our Linux Server Management services, in which case you can simply ask our expert Linux admins to install Phabricator for you. They are available 24×7 and will take care of your request immediately. PS. If you liked this post on how to install Phabricator on Ubuntu 16.04, please share it with your friends on the social networks using the buttons on the left or simply leave a reply below. Thanks. Need Help with your Linux Server?